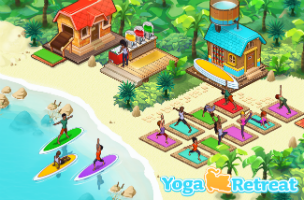 Finnish game developer Gajatri Studios has launched its yoga-themed mobile simulation game Yoga Retreat on iOS devices. The game is aimed at what Gajatri Studios calls an “underserved segment” of players: 18 to 55 year-old women who play casual games, enjoy the simulation genre and are also interested in healthy living, yoga and so on. In Yoga Retreat, players open their own resort for yoga and relaxation. Customers appear near yoga mats, and can be assigned moves to complete. These moves take time to complete but reward players with coins and experience points when finished. They also come along with animated videos for players to practice the moves themselves in the real world. After practicing yoga, some guests want to contemplate their progress on nearby chairs, while others are satisfied with a refreshing drink. The more tasks players complete for their guests, the higher rated their resort becomes. As players expand their resort, they can purchase additional yoga mats to take care of more guests at the same time, or purchase more land for their resort. Land houses fruit trees and bushes, which can be tended to collect coconuts, oranges, acai berries and other items. These, in turn, are used in the juice bar to fulfill customer wishes. Once players level up to specific milestones, they’ll unlock more attractions for their resort. Reaching level 10, for instance, unlocks the ability to teach yoga courses on paddle boards on the water, while Level 20 unlocks a garden for teaching laughter yoga. Yoga Retreat was first released in three markets for a soft-launch testing period. During that time, over 20 percent of the game’s daily active players completed at least five animated yoga instruction videos each day, which fits with the developer’s goal to provide more than just a gameplay experience to users. “Our goal is to be the healthy choice for mobile gamers worldwide. This product will evolve both as a fun simulation game and as a casual health experience [inside the game],” said Gajatri Studios founder and CEO Tiina Zilliacus. Yoga Retreat is available to download for free on iOS devices. The game is supported via premium currency, which can be used to finish tasks instantly, or to purchase resort expansions without waiting to do so for free.